However, interior design has a few optical illusions up its sleeve. There are plenty of easy design techniques and products to make your vast space feel more cosy and intimate. Let us show you how. Let’s start by exploring levels. 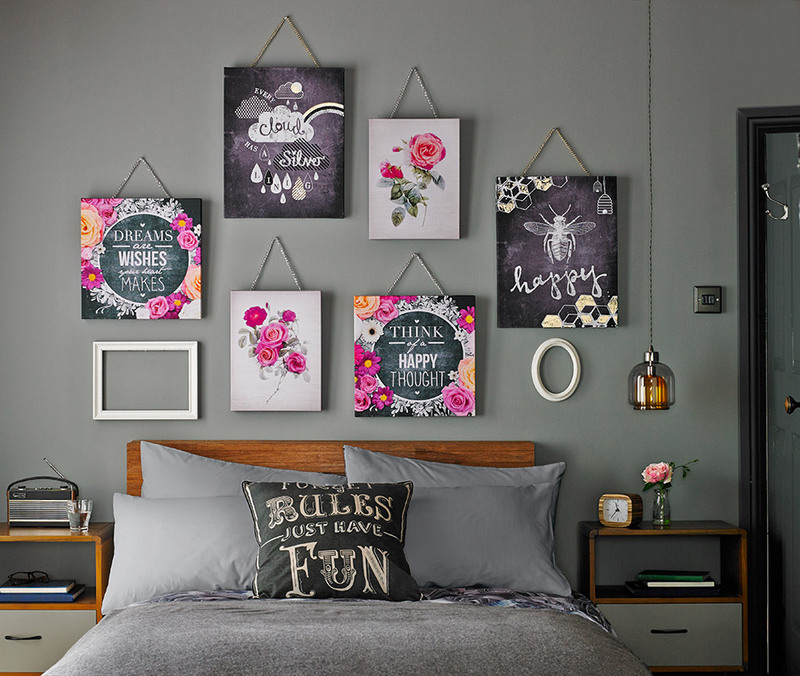 You’re probably used to carefully aligning wall art and furnishings all on one level. God forbid one piece looks wonky or out of place! However, by changing the levels we work on and altering where we hang each piece of wall art, we can help to fill up more space on the walls. Using topography in a room ensures that all of the features that draw you in aren’t all on one eyeline. So perhaps you’ll choose to hang your canvases a little higher on one wall, as opposed to another? 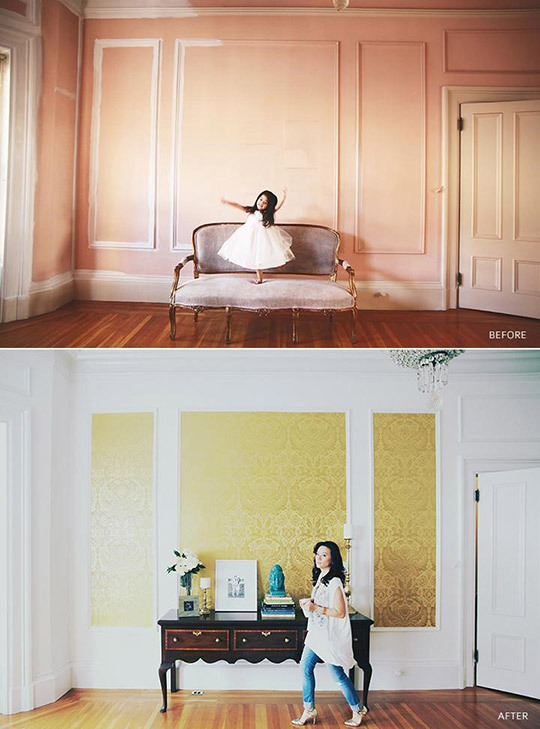 Try using the rule of thirds to split your walls into sections and ensure that no section is left empty. Whether it’s a hanging light fittings or large-scale wall art, once you begin to mix and match elements to fill each level, you’ll find it much easier to fill the vast blank space. Using wallpaper in sections along your wall can also help to fill up the space. As you can see in the image below, Kellie from Le Zoe Musings has beautifully demonstrated the way wallpaper can be used on tall walls. Using our Desire wallpaper, the metallic shimmer waves up and down the wall to celebrate its grandeur. The dramatic change created by this stunning damask motif really brings the room together and makes those tall walls much less barren. It’s also a great example of how you can make a bold statement while only wallpapering certain sections of your wall. You could also cover more space for an equally sophisticated finish. 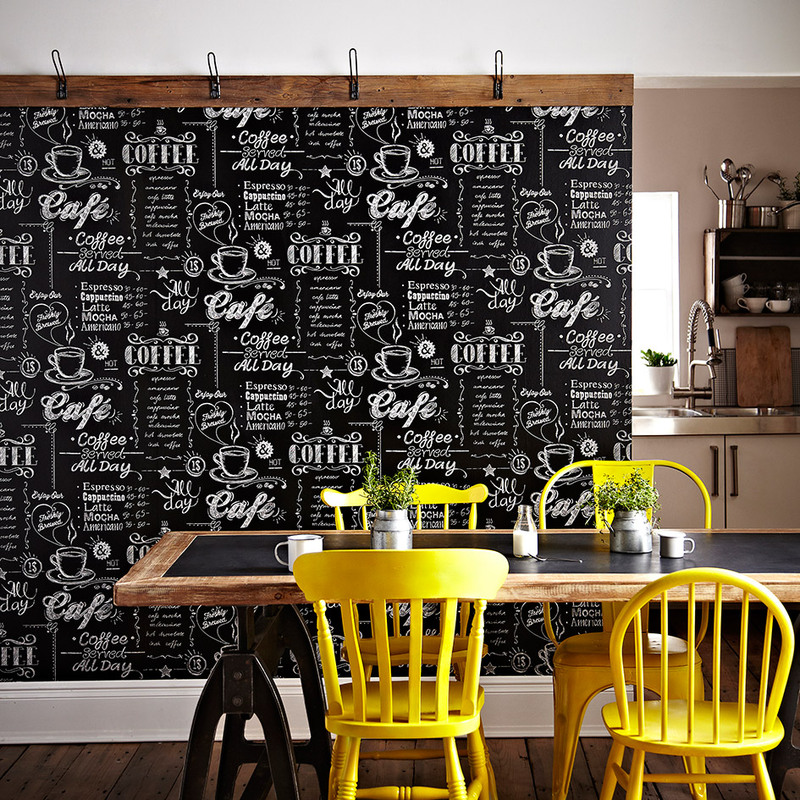 As you can see, our Coffee Shop Black/White wallpaper looks fantastic in kitchen spaces, but can also be used as an inlay to create a quirky twist in larger spaces. Leaving space above the wallpaper creates a beam of white that will help to illuminate the room. A small photo frame here and there just won’t cut it if your walls are huge. You’re going to have to avert back to our rule of thirds to create a gallery of wall art that brings your walls back down the size. 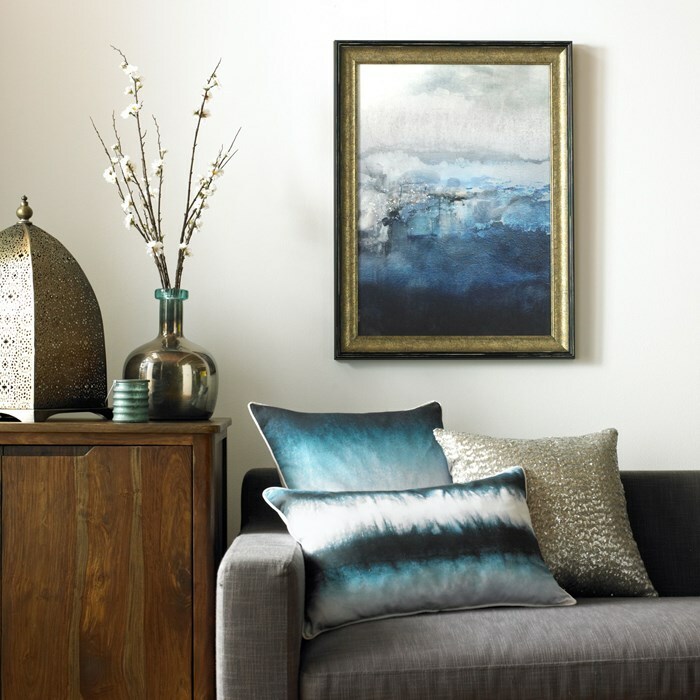 Our larger framed wall art offers a colorful burst of vibrancy that will certainly look well placed on taller walls. Remember to mix up the levels you’ve been working on and find complementing accessories - a few matching pillows perhaps - to work alongside your chosen pieces. Using color accents, it’s easy to create a palette to guide your wall art selections and collate a gallery of wall art that works together. Hopefully we’ve shown you that just because your walls are so tall, it doesn't mean you can’t create a welcoming, cosy ambience. We’d love to see how you’ve gone about decorating your high-ceiling rooms!